Sen. Roach speaks out against Common Core. Photo courtesy of Washington State Senate. 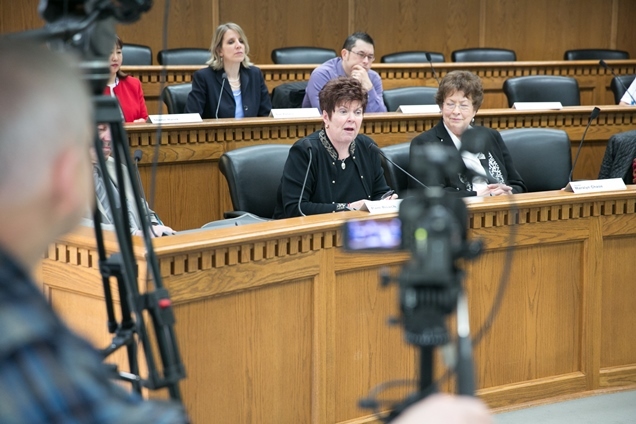 Last week, two Washington State Senators hosted a legislative meeting to discuss what can be done to remove the standards from Washington schools. Sen. Maralyn Chase, a Democrat, and Sen. Pam Roach, a Republican, were able to put aside their political differences and work together for the sake of protecting the interests of children across the state. “Common Core is uniting liberals and conservatives like no issue I have seen,” said Chase. Part of this pushback is a response the Washington State Supreme Court, which has essentially threatened to hold legislators in contempt over an issue of school funding. “Lawmakers set the policies that guide how education dollars are spent. Common Core does not make the best use of those dollars,” Roach said. “Our state fell victim to the ‘testing-industrial complex.’ Now it is up to us to defend the children by withdrawing from Common Core,” said Chase. The two senators are cosponsors of a bill that would remove Common Core standards from Washington and require the state to return to earlier standards that did not place so much emphasis on standardized testing. While the chances of their bill advancing this year are slim, given Washington’s political climate, the lawmakers are looking forward to 2016 when presidential politics are likely to make Common Core a key issue. The event included presentations from educators, activists, education policy experts, and was moderated by Dora Taylor, of the League of Women Voters Education Committee. Seen this Common Core in the ARMY NCO Testing and the preparation courses for it Called SDT it replaced SQT. These courses couldn't motivate a Camel to take a drink of water at an Oasis after a ten day Jant in the desert. Vladimir Putin the Russian Refuses to use this Pitiful Common Core soul swiping Communist Indoctrination because it would strip any technological advantage he has away from Rusia ! When No Communist will not allow it, "Something Stinks in Denmark" and you can rest assure it will take your children away from you !! Take All your Children out of Public Education if you love them Mom's and Dad's. Stay away from Public Universities as well they will take your children away and turn them into Communist Liberal Anti Constitutional Democrats Zombies, that have no recollection of " Ask Not what your Country can do for you but what you can do for your country" A president that dreamed to go to the Moon President John Fitzgerald Kennedy a real Democrat ! !